The most fundamental variables of triathlon training are volume and intensity. In lay terms, volume is how much you swim, bike, and run and intensity is how hard you do these things. No other factor affects the outcomes of training as strongly as these two. Of course, in order to do this you must first know what low, moderate, and high-intensity mean for you. As mentioned above, the borderline between low and moderate intensity is the first ventilatory threshold, which falls around 77 percent of maximum heart rate in the typical trained triathlete. Why this threshold and not the more familiar lactate threshold, which is somewhat higher? Because research by Stephen Seiler and others suggests that training slightly above the ventilatory threshold is significantly more stressful to the nervous system than training slightly below it, even when intensity remains below the lactate threshold. The borderline between moderate and high intensity is the second ventilatory threshold, or the respiratory compensation point, which falls around 92 percent of maximum heart rate in the typical trained triathlete. My 80/20 Training partner David Warden has created an online calculator that makes it easy to determine individual training zones in swimming, cycling, and running. We use a five-zone scheme where Zones 1 and 2 are low intensity, Zone 3 is moderate intensity, and Zones 4 and 5 are high intensity. 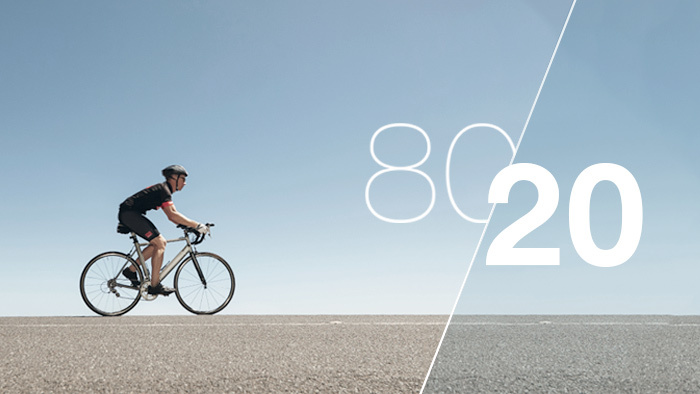 Planning to train by the 80/20 Rule is one thing. Actually doing it is another. On a practical level, getting in line with this rule requires slowing down a little in workouts that are intended to be done at low intensity. A majority of recreational triathletes unconsciously self-select swim, bike, and run speeds that are slightly above the ventilatory threshold in basic aerobic conditioning sessions. In other words, when athletes think they are at low intensity, they are in fact at moderate intensity, a phenomenon I call “intensity blindness”.